Since deciding to open Icelandic Thunder, it's been my mission to provide a secure and welcoming environment for my horses and people wanting to learn more about Icelandics and their care. I now have an indoor riding arena in addition to a 60 foot outdoor roundpen where riding and training can take place 24/7 at anytime of the year. I have been in love with the horse since I can remember. I was not allowed to own one until I was out on my own at 21 years. 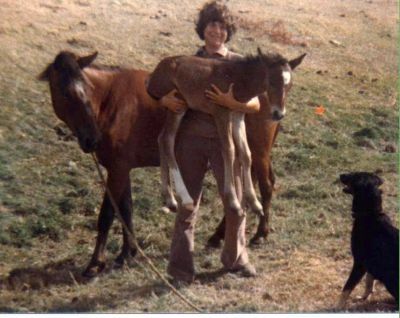 I had worked at a Standardbred racetrack in my teens and learned from the ground up on how to care for them. 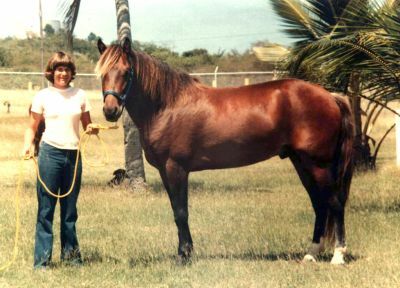 I bought my first horse, an Island pony on Antigua and trained her to ride in the Ocean. My love only grew. We bought our farm here in Philippi, WV in the fall of 1997 after living downrange for eighteen years. We started raising Arabians in 1998 and had our first child in 1999. Our second child came in 2001 and when they were both toddling around outside I began to worry. I loved my Arabians but it did not seem to matter how much time I spent with them I just couldn't get the jump out of them. If the wind blew a leaf in front of them they reacted. I will be the first to admit that I may not be the best of horse trainers but I had to handle them every day. I began to do some research on the internet to find a safer, more predictable breed so that I could raise horses and children together. I discovered the Icelandic and Rocky Mountain at about the same time. I now have two herds of horses here on my farm and am so pleased with the both of them. Their temperments are actually very similar being laid back and docile and both have smooth gaits. I am presently leaning more on the Icelandic side of the fence but both are fantastic horses for my family. We do not crossbreed because both breeds are in themselves a total package. Icelandic Horses are a very special, unique breed of horse. They average at 13 - 14 hands with stocky builds, having short backs, wide bodies with well sprung ribs, mutton withers, lots of bone, hard dense hooves and an incredible thinking side of the brain. This is what separates them from most other horse breeds because they usually react differently than a typical and more common breed of horse. Their intelligence is allowed to surface more often before reactivity takes over and this keeps them (and a rider) safer than with most other breeds. They generally spook less than most other breeds and their fright/flight reaction is diminished possibly because there are no known predators in Iceland. If an Icelandic ever showed aggression to humans in Iceland, weather it was by hoof or mouth, it was on the dinner table and taken out of the gene pool. They are incredibly versitle and some are very talented jumpers.